Alright... I've been away for far too long. I've got a bunch of post-conference stuff to post, as I attended the NCEMSF (National Collegiate EMS Foundation) 20th Anniversary Conference in Crystal City VA in February, then attended "Vest Fest" (Rangemaster Tactical Conference and Polite Society Match) in Memphis, and then EMS Today in Washington, DC. Oh, and I've started a new PRN job. I promise there will be AAR's for all... eventually. Anyway... the last lecture I attented at EMS Today was on Saturday, and I heard Gordon Graham talk about non-punitive critical event reporting. He's part of the group behind FirefighterCloseCalls.com and Chief Goldfelder's "The Secret List". If you aren't already getting TSL emails, you're missing out. They are a combination of alerts of LODD's (Line of Duty Deaths), alerts and follow up of serious incidents, and some advice and remembrance of major incidents. Just last week, Chief Goldfelder sent out an email that hits very close to home: "Lionville, GA LODD Details, "Wrong Way" Crash Lawsuit (The Secret List)"
At approximately 1418 hours on 3/9/1998, Lionville Fire Company (Chester County, PA) and Uwchlan Ambulance were dispatched to a single vehicle automobile crash at milepost 310.9, just west of the Downingtown Interchange on the Pennsylvania Turnpike. A Heavy Rescue Truck, Engine Company, Assistant Chief and Ambulance responded. Upon arrival on the scene, the Ambulance, Rescue Truck, and Assistant Chief's vehicle parked on the shoulder of the road off the travel lanes of the highway. At the same time, two additional crashes were reported on the Turnpike. The second accident was reported at milepost 307 westbound (west of the first incident). The Engine responding to the first accident was directed to continue past the primary scene to respond to the second crash. A third accident was reported of a vehicle overturned at milepost 314 on the eastbound side of the highway (east of the original incident). Then Lionville Fire Chief William Minahan responded to that call with mutual aid units to investigate. 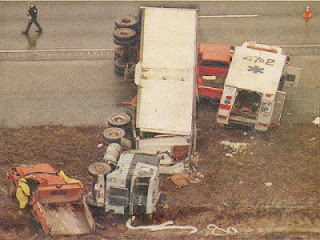 At 1438 hours, as personnel were loading the accident victim into the Uwchlan Ambulance, a tractor trailer traveling westbound lost control and crashed into the Assistance Chief's vehicle, overturned, and slid into the back of the ambulance and the other responders in that area. The Assistant Chief and a Firefighter with him in his truck were trapped in the severely damaged vehicle and had to be extricated by mutual aid rescue personnel using the Jaws of Life. Firefighter Dave Good of the Lionville Fire Company was killed in the line of duty. Nine other emergency responders were injured, three seriously. The injured included Assistant Chief Steve Senn, Firefighters Chris Good, Mike Cox, Eric John, Pete Harmansky, James Rattrie, and Robert Doan, all firefighters with the Lionville Fire Company, and EMT Brent Kaplan and EMT John Wanczyk of Uwchlan Ambulance. Firefighter David Good was 38 years old and had 5 years of service as a Firefighter with Lionville Fire Company. He was survived by his wife Maryanne and two sons, Johnathan and Jason Good. RIP. That incident 15 years ago eventually led to the production of a video called the “10 Cones of Highway Safety” and a training program about Highway Safety both by VFIS. It also was one of two Firefighter struck-by-vehicle line of duty deaths in 1998 that led to the formation of the Emergency Responder Safety Institute (ERSI) (www.respondersafety.com ) a committee of the Cumberland Valley Volunteer Fireman’s Assoc. I'm from Chester County, PA. This incident happened a year and a half before I joined the local FD's Explorer Post. Growing up in the firehouse, I had many mentors that were on that scene. It changed how we responded to highway incidents, especially the PA Turnpike. I remember stories of our Chief going toe-to-toe with State Troopers demanding that our blocking apparatus be moved from a travel lane. There were threats of arrest. Thankfully, it never came to that - but my Chief at the time made it clear that our safety was paramount, and that if we had to, we closed whatever lane(s) the IC felt was needed... up to and including the highway. Every so often someone will comment that Uwchlan EMS doesn't have an "Ambulance 87-2"
And in another sad note... now-Captain Chris Good died in the Line of Duty himself last November. I no longer run as a firefighter in Pennsylvania. In addition to my work as a Paramedic in PA, I'm volunteering in Prince George's County, MD. Last summer, they had two incidents in less than a month where engines were struck while providing barrier protection on the Capitol Beltway (I-495). Two stories about those incidents: http://pgfdpio.blogspot.com/2012/09/beltway-near-miss-again-avoided-by.html and http://pgfdpio.blogspot.com/2012/08/barrier-protection-difference-between.html. 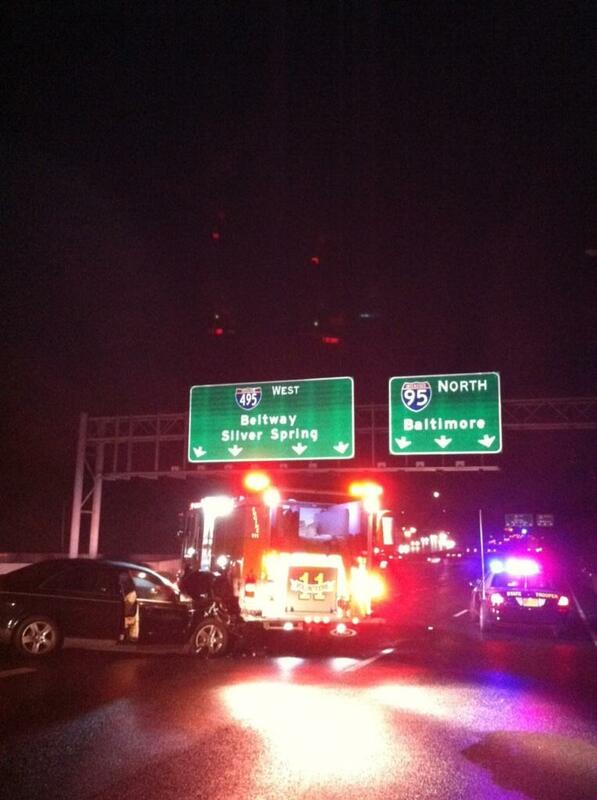 Those incidents happened in an area of the Beltway I've responded to before. Both of these happened in the late night / early morning hours of a weekend. The incident involving Greenbelt's (35's) engine actually involved 2 separate collisions... one into the engine, and one into the striking vehicle some time later. Where am I going with this rather long blog? Well, we need to learn from incidents that have killed or seriously injured *us" in the past. We also need to study and learn from near-miss incidents that COULD have killed us... but didn't. Often, luck plays as much a role as anything in the difference between a near-miss and a LODD. FirefighterCloseCalls.com is a good source for that information. Lastly - be careful in traffic. Treat every driver as if they are blind, intoxicated, and texting. Use blocking apparatus whenever possible.